Three O'Clock in the Morning , performed by Paul Whiteman and his Orchestra for Victor Records. George Jacob Gershwin was an American composer and pianist whose compositions spanned both popular and classical genres. Among his best-known works are the orchestral compositions Rhapsody in Blue (1924) and An American in Paris, the songs Swanee (1919) and Fascinating Rhythm (1924), the jazz standard I Got Rhythm (1930), and the opera Porgy and Bess (1935) which spawned the hit Summertime. Whiteman recorded many jazz and pop standards during his career, including "Wang Wang Blues", "Mississippi Mud", "Rhapsody in Blue", "Wonderful One", "Hot Lips (He's Got Hot Lips When He Plays Jazz)", "Mississippi Suite", "Grand Canyon Suite", and "Trav'lin' Light". He co-wrote the 1925 jazz classic "Flamin' Mamie". His popularity faded in the swing music era of the mid-1930s, and by the 1940s he was semi-retired from music. He experienced a revival and had a comeback in the 1950s with his own network television series, Paul Whiteman's Goodyear Revue , which ran for three seasons. He also hosted the 1954 ABC talent contest show On the Boardwalk with Paul Whiteman . "Wang Wang Blues" is a 1920 jazz composition written by Henry Busse, Gussie Mueller, and Theron E. "Buster" Johnson, with lyrics by Leo Wood. The song was released as a 78 single by Paul Whiteman and his Orchestra featuring Henry Busse on trumpet. The song is a pop and jazz standard. "Mississippi Mud" is a 1927 song written by Harry Barris, first sung by Bing Crosby as a member of Paul Whiteman's Rhythm Boys. "Wonderful One" is a popular song recorded by the Paul Whiteman Orchestra on January 25, 1923 in New York and was released as Victor 19019-B. The record reached no. 3 on the Billboard chart. The song was also recorded as "My Wonderful One". Whiteman was born in Denver, Colorado. He came from a musical family: his father, Wilburforce James Whiteman  was the supervisor of music for the Denver Public Schools, a position he held for fifty years. , and his mother Elfrida (née Dallison) was a former opera singer. His father insisted that Paul learn an instrument, preferably the violin, but the young man chose the viola.  . According to Chris Popa, Whiteman was Protestant and of Scottish, Irish, English, and Dutch ancestry  , although he is listed as Jewish in an interview with Michael Lasser   . In 1927 the Whiteman orchestra backed Hoagy Carmichael singing and playing on a recording of "Washboard Blues". Whiteman signed with Columbia Records in May 1928, leaving the label in September 1930 when he refused a pay cut. He returned to RCA Victor between September 1931 and March 1937. In the 1920s the media referred to Whiteman as "The King of Jazz". Whiteman emphasized the way he approached the well-established style of jazz music, while also organizing its composition and style in his own fashion. For more than 30 years Whiteman, referred to as "Pops", sought and encouraged promising musicians, vocalists, composers, arrangers, and entertainers. In 1924 he commissioned George Gershwin's Rhapsody in Blue , which was premiered by his orchestra with the composer at the piano. Another familiar piece in Whiteman's repertoire was Grand Canyon Suite by Ferde Grofé. Whiteman composed the piano work "Dreaming The Waltz Away" with Fred Rose in 1926. Organist Jesse Crawford recorded the song on October 4–5, 1926, in Chicago, Illinois and released it as a 78 on Victor Records, 20363. Crawford played the instrumental on a Wurlitzer organ. The recording was also released in the UK on His Master's Voice (HMV) as B2430. In Louis Armstrong & Paul Whiteman: Two Kings of Jazz (2004), Joshua Berrett wrote that "Whiteman Stomp" was credited to Fats Waller, Alphonso Trent, and Paul Whiteman. Lyricist Jo Trent is the co-author. The Fletcher Henderson Orchestra first recorded "Whiteman Stomp" on May 11, 1927, and released it as Columbia 1059-D. The Fletcher Henderson recording lists the songwriters as "Fats Waller/Jo Trent/Paul Whiteman". Whiteman recorded the song on August 11, 1927, and released it as Victor 21119. In 1927, Paul Whiteman co-wrote the song "Wide Open Spaces" with Byron Gay and Richard A. Whiting. The Colonial Club Orchestra released a recording of the song on Brunswick Records in 1927 as 3549-A with Irving Kaufman on vocals. ↑ "Paul Whiteman - American bandleader". Britannica.com. Retrieved October 28, 2017. ↑ "Paul Whiteman: American Bandleader" . Retrieved August 19, 2017. 1 2 3 "Paul Whiteman 'The King of Jazz' (1890-1967)". Red Hot Jazz. Retrieved April 12, 2015. 1 2 DeVeaux, Scott; Giddins, Gary (2009). Jazz (1 ed.). New York: W.W. Norton. ISBN 978-0-393-06861-0. ↑ Yanow, Scott. "Paul Whiteman". AllMusic. Retrieved 14 August 2009. ↑ Ellington, Edward Kennedy (1973). Music is My Mistress (Repr. d. Ausg. Garden City, N.Y. 1973. ed.). New York: Da Capo Press. ISBN 0-306-80033-0. ↑ "Answers to Questions," Cleveland Plain Dealer, June 2, 1935, p. M-10. ↑ "Paul Whiteman Dead at 77 of Heart Attack", Rockford IL Register-Republic, December 29, 1967, p. 1. ↑ "Music Industry Giant, Paul Whiteman Dead at 77", Boston Herald, December 30, 1967, p. 10. ↑ Adrian Cho (December 4, 2008). "Jewish Influences in Jazz" (PDF). Program notes for the Impressions in Jazz orchestra concert Benny Goodman @ Carnegie Hall, at Dominion-Chalmers United Church. Retrieved March 30, 2019. ↑ Cindy Mindell (interviewer), Michael Lasser (interviewee) (March 19, 2014). "Jews & Jazz". CT Jewish Ledger. Retrieved March 30, 2019. ↑ "Paul Whiteman: American Bandleader". Encyclopædia Britannica . Retrieved April 12, 2015. ↑ Albert Haim, "Paul Whiteman and His Ambassador Orchestra", network54.com; accessed January 7, 2016. ↑ "History of Jazz Time Line: 1922". All About Jazz. Archived from the original on April 15, 2011. Retrieved December 2, 2010. ↑ Wilder, Alec (1990). American Popular Song: The Great Innovators 1900–1950. New York & Oxford: Oxford University Press. ISBN 0-19-501445-6. ↑ Berrett, Joshua (2004). Louis Armstrong & Paul Whiteman: Two Kings of Jazz. Yale University Press. p. 123. ISBN 978-0-300-10384-7. 1 2 "Paul Whiteman Biography". PBS . Retrieved April 12, 2015. ↑ Whitburn, Joel (1996). The Billboard Book of Top 40 Hits (6. ed., rev. and enl. ed.). New York: Billboard Publications. ISBN 9780823076321. 1 2 Vera, Billy (2000). From the Vaults Vol. 1: The Birth of a Label - the First Years (CD). Hollywood: Capitol Records. p. 2. ↑ Rayno, Don (2003). Paul Whiteman - Pioneer in American Music - Volume 1: 1890-1930. Lanham, Maryland, USA: Scarecrow Press, Inc. p. 183. ISBN 0-8108-4579-2. ↑ "Variety". January 11, 1928. ↑ Rayno, Don (2003). Paul Whiteman - Pioneer in American Music - Volume 1: 1890-1930. Lanham, Maryland, USA: Scarecrow Press, Inc. p. 192. ISBN 0-8108-4579-2. ↑ "New York Herald Tribune". March 30, 1928. ↑ Pairpoint, Lionel. "...And Here's Bing!". BING magazine. International Club Crosby. Retrieved January 30, 2016. ↑ Terrace, Vincent (1999). Radio Programs, 1924–1984: A Catalog of More Than 1800 Shows. McFarland & Company, Inc. ISBN 978-0-7864-4513-4. Pp. 510–511. ↑ Dunning, John (1998). On the Air - The Encyclopedia of Old-Time Radio. New York: Oxford University Press. pp. 70–71. ISBN 0-19-507678-8. ↑ "Entertainers". Time . March 6, 1944. Retrieved April 19, 2009. ↑ "Stockton". Delaware and Raritan Canal State Park . Retrieved April 19, 2009. ↑ "Bucks County Artists". James A. Michener Art Museum . Retrieved April 19, 2009. ↑ "Paul Whiteman, 'the Jazz King' Of the Jazz Age, Is Dead at 77". The New York Times . December 30, 1967. ↑ Library of Congress. Copyright Office (1920). Catalog of Copyright Entries: Musical compositions. U.S. Government Printing Office. p. 1842. Retrieved January 8, 2017. ↑ Catalog of Copyright Entries, 1948. Copyright renewal by Paul Whiteman, I.M. Bibo, and Edna L. Johnson, google.com; accessed January 7, 2017. ↑ Library of Congress. Copyright Office (1920). Catalog of Copyright Entries: Musical compositions. U.S. Government Printing Office. p. 1690. Retrieved January 8, 2017. ↑ Library of Congress. Copyright Office (1952). Catalog of Copyright Entries: Third series. pp. 1–95. Retrieved January 8, 2017. ↑ Library of Congress. Copyright Office (1952). Catalog of Copyright Entries: Third series. pp. 1–143. Retrieved January 8, 2017. ↑ "Victor Discography: Paul Whiteman (composer)". Victor.library.ucsb.edu. Retrieved April 8, 2012. ↑ Library of Congress. Copyright Office (1953). Catalog of Copyright Entries: Third series. pp. 1–125. Retrieved January 8, 2017. ↑ Fletcher Henderson Orchestra profile, Discogs.com; accessed January 7, 2017. ↑ "Catalog of Copyright Entries 1954 Renewal Registrations-Music Jan-Dec 3D Ser Vol 8 Pt 5C". Archive.org. archive.org. Retrieved January 8, 2017. ↑ Library of Congress. Copyright Office (1920). Catalog of Copyright Entries. U.S. Government Printing Office. p. 1268. Retrieved January 8, 2017. ↑ Discography of American Historical Recordings, library.ucsb.edu; accessed January 7, 2017. ↑ Rayno, Don. Paul Whiteman: Pioneer in American Music. Volume II: 1930-1967, Lanham, MD: Scarecrow Press, 2013, p. 705; accessed January 7, 2017. ↑ Abrams, Steven and Settlemier, Tyrone. "The Online Discographical Project: Victor 35500 – 36000 numerical listing". Retrieved December 26, 2010. ↑ "Grammy Hall of Fame. "Whispering" by Paul Whiteman. Grammy.org". grammy.org. Retrieved January 8, 2017. ↑ "Grammy Hall of Fame. 1974 inductions. George Gershwin with Paul Whiteman. 1927 recording. Grammy.org". grammy.org. Retrieved January 8, 2017. ↑ Big Band and Jazz Hall of Fame: 1993 Inductees. ↑ "Hollywood Star Walk: Paul Whiteman". Los Angeles Times . Associated Press. December 30, 1967. ↑ "Paul Whiteman | Colorado Music Hall of Fame". cmhof.org. Retrieved January 8, 2017. ↑ "20th Century Pioneers Exhibit | Colorado Music Hall of Fame". cmhof.org. Retrieved January 8, 2017. ↑ Murrells, Joseph (1978). The Book of Golden Discs (2nd ed.). London: Barrie and Jenkins Ltd. pp. 11/2. ISBN 0-214-20512-6. Leon Bismark "Bix" Beiderbecke was an American jazz cornetist, pianist, and composer. Ferde Grofé was an American composer, arranger, pianist and instrumentalist. During the 1920s and 1930s, he went by the name Ferdie Grofé. 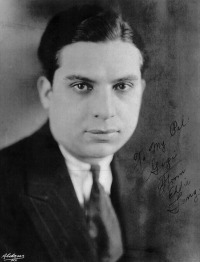 Eddie Lang is known as the father of jazz guitar. During the 1920s, he gave the guitar a prominence it previously lacked as a solo instrument, as part of a band or orchestra, and as accompaniment for vocalists. He recorded duets with guitarists Lonnie Johnson and Carl Kress, with jazz violinist Joe Venuti, and played rhythm guitar in the big bands of Paul Whiteman and Bing Crosby. James Dorsey was an American jazz clarinetist, saxophonist, composer and big band leader. He was known as "JD". He recorded and composed the jazz and pop standards "I'm Glad There Is You " and "It's The Dreamer In Me". His other major recordings were "Tailspin", "John Silver", "So Many Times", "Amapola", "Brazil ", "Pennies from Heaven" with Bing Crosby, Louis Armstrong, and Frances Langford, "Grand Central Getaway", and "So Rare". He played clarinet on the seminal jazz standards "Singin' the Blues" in 1927 and the original 1930 recording of "Georgia on My Mind", both inducted in the Grammy Hall of Fame. Orie Frank Trumbauer was one of the leading jazz saxophonists of the 1920s and 1930s. His main instrument was the C-melody saxophone, a now-uncommon instrument between an alto and tenor saxophone in size and pitch. He also played alto saxophone, bassoon, clarinet and several other instruments. Blue Monday was the original name of a one-act "jazz opera" by George Gershwin, renamed 135th Street during a later production. The English libretto was written by Buddy DeSylva. Though a short piece, with a running time of between twenty and thirty minutes, Blue Monday is often considered the blueprint to many of Gershwin's later works, and is often considered to be the "first piece of symphonic jazz" in that it was the first significant attempt to fuse forms of classical music such as opera with American popular music, with the opera largely influenced by Jazz and the African-American culture of Harlem. The Mississippi Suite is a 1925 orchestral suite in four movements by Ferde Grofé, depicting scenes along a journey down the Mississippi River from its headwaters of Minnesota down to New Orleans. Nadine Dana Suesse was an American musician, composer and lyricist. Roy Fredrick Bargy was an American composer and pianist. 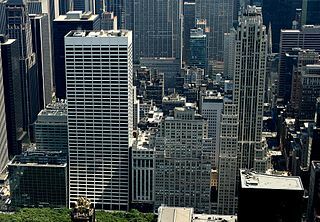 Aeolian Hall was a concert hall in midtown Manhattan in New York City, located on the third floor of 29-33 West 42nd Street across the street from Bryant Park. The Aeolian Building was built in 1912 for the Aeolian Company, which manufactured pianos. Located on the site of the former Latting Tower, which during the 19th century was a popular observatory, the 18-story building contained the 1,100-seat Aeolian Hall. The building stands next to the Grace Building. Alfred J. Gallodoro, was an American jazz clarinetist and saxophonist, who performed from the 1920s up until his death. He is notable for having played lead alto sax with the Paul Whiteman Orchestra and bass clarinet for 12 years with the NBC Symphony Orchestra under Arturo Toscanini. Bandleader Jimmy Dorsey praised him as "the best sax player who ever lived." Lee Sims was an American pianist, composer, record maker, publisher and performer. George Marsh was an American jazz drummer. In the 1920s, he played with one of Paul Whiteman's bands, as well as recording with musicians including Frankie Trumbauer and Eddie Lang. From 1932 to 1934, Marsh played in an orchestra led by Ferde Grofé. He later moved to California, where he worked in film music. He died in Los Angeles in April 1962. Steven Richman is an American conductor and writer. He is music director of Harmonie Ensemble/New York, which he founded in 1979, and the Dvořák Festival Orchestra of New York. Wikimedia Commons has media related to Paul Whiteman .